This past year, we started a tradition of Pizza Fridays. It's the perfect thing to wind down the week with - a mini-celebration featuring a yummy special dish. I've been making homemade pizza for a couple of decades, but never really had an established pizza night. G and I decided it would be a fun addition to our weekly schedule and give us a special treat to look forward to throughout the week. I've played with the dough recipe a bit over the years, but it hasn't changed much. Depending on my mood, I sometimes make minor adjustments. Tonight I've substituted 1 cup of home-ground spelt flour for a cup of the wheat, just to mix things up a little. G and I are happy with a 100% whole wheat crust, but often if we have company, we'll substitute some regular bread flour to make the crust a little fluffier. Feel free to tinker with the flour amounts yourself, although I suggest using a minimum of 1 cup of whole wheat flour because with that much, you can't even really tell a difference. I'll also add in spices to my crust from time to time and I've even been known to roll cheese into the edge to create our own stuffed-crust pizza. You are only limited by your imagination, but be sure to check out these 15 ideas if you're in the mood for something a little bit different! As far as toppings go, the possibilities are endless. 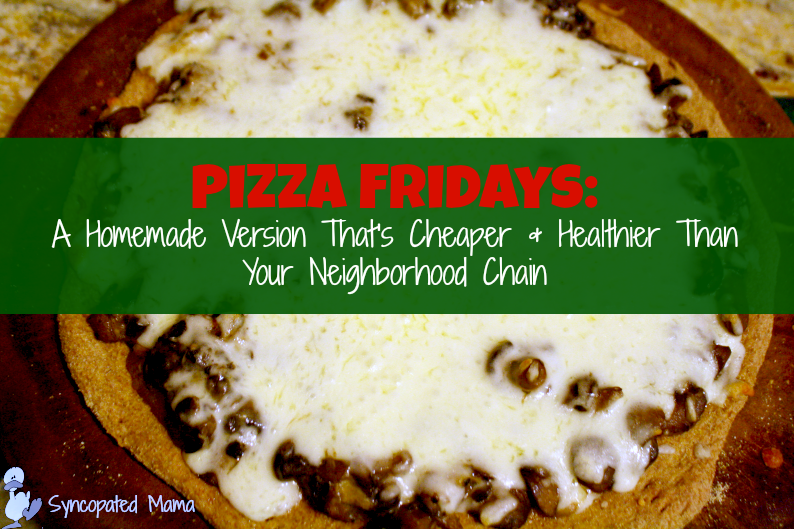 I'm not even sure we've ever had the same pizza twice, because I usually just take whatever we have on hand (often whatever vegetables are in season, on sale, and that we have a lot of) and then create the pie from that. If we have a bunch of eggplants, they'll go on top. If we don't have anything fresh, I'll thrown on frozen broccoli or spinach. Sometimes I use sauce, sometimes I don't. 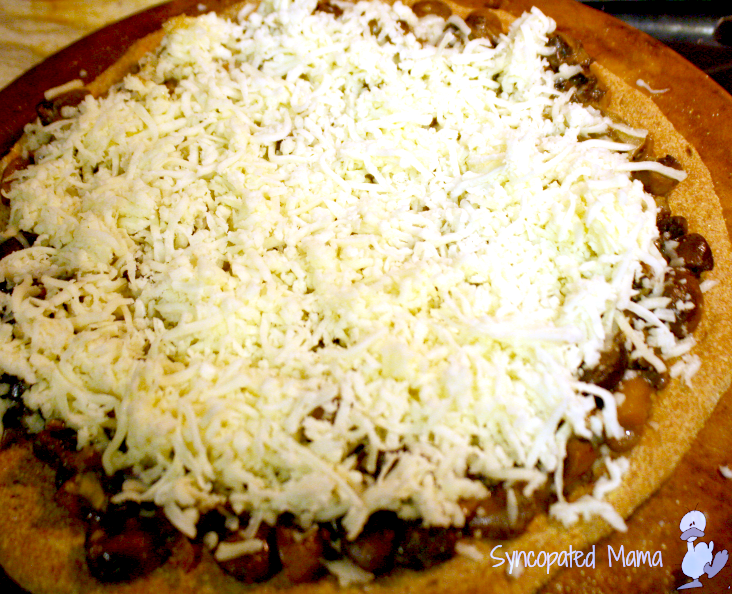 We usually cover it with shredded mozzarella, but if we're out of it, I'll use whatever cheese we have laying around. And of course I make my dough in the bread machine, because I can just dump everything in and an hour and a half later be ready to roll out my crusts. 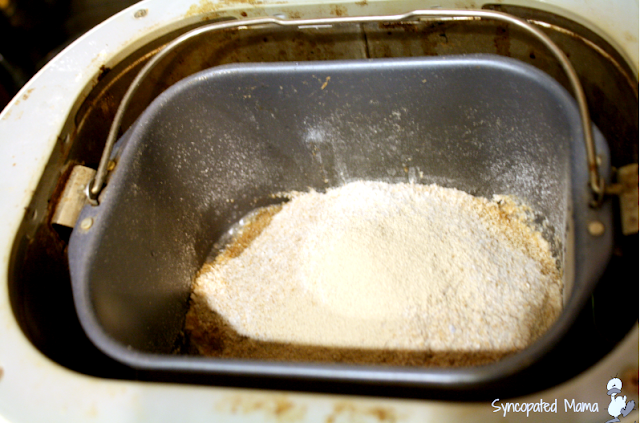 You don't have to have a bread machine to make dough, though, just a bit more elbow grease and baby-dough-sitting. Incidentally, I use this same dough recipe to make calzoni and stromboli. What's the difference, you ask? A calzone is a pizza pocket filled with ricotta (and sometimes ham) with the sauce served on the side. A stromboli is a pizza pocket filled with whatever you'd normally put on your pizza. 1. Dump everything into your bread machine. Set it for the dough cycle, hit start (very important to remember this step!) and walk away. 2. Remove the dough and divide it in half. 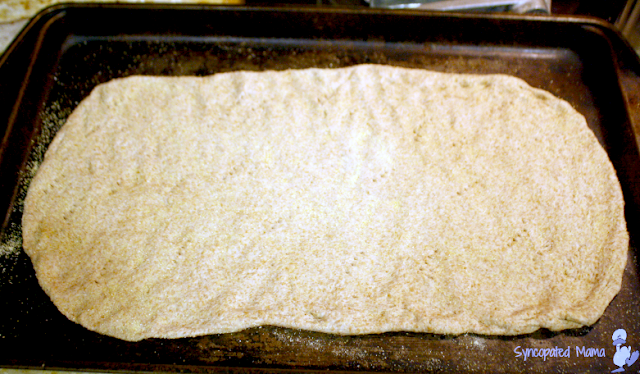 Stretch or roll each portion of dough out to fit your desired baking pan or pizza stone. We only have one pizza stone, so one pizza gets made on that and the other on a large cookie sheet. I usually sprinkle a little cornmeal down first (especially if I'm rolling it) so that it doesn't stick, but that's up to you. Poke holes all over the top with a fork. 3. Bake at 400 degrees for 12-15 minutes (depends on how crispy you want the crust). 4. 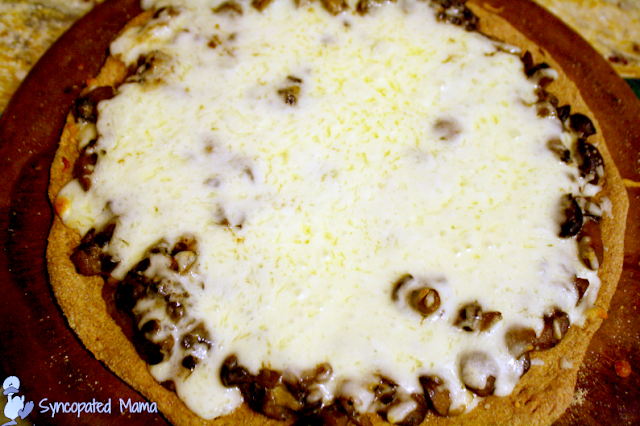 Remove crusts and top with whatever your little heart desires (tonight ours was mushrooms, fresh garlic, and of course, cheese). 5. Return pizzas to oven and bake for an additional 10-15 minutes, or until it's as done as you want it. Let it cool for just a little bit before you cut it with your pizza wheel, otherwise the cheese will just ooze off in a big glob. Mmmm...an added benefit to this recipe for us is that we usually don't eat both pizzas that night (although I could! ), so that means we have leftovers for the next day! Have you ever made your own pizza? Do you have a regular pizza night? If so, think about how much money you could save by making your own! It's really easy to do, and only gets easier the more often you make it! I'd love to hear - leave a comment or email me at lisahealy (at) outlook (dot) com. Like this recipe? Find it and other delicious kid-friendly treats in the book Yum! 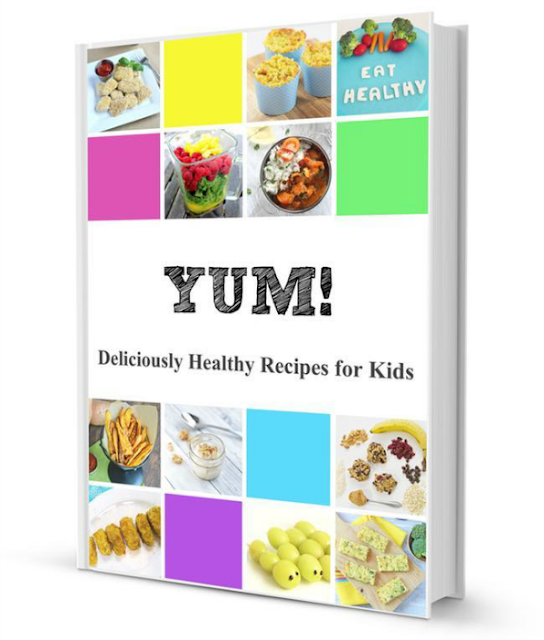 Deliciously Healthy Recipes for Kids that I co-authored!